It’s not a stretch to suggest Mark Newnham could have four or five runners in the Group 1 ATC Oaks (2400m) on Day 2 of The Championships in April. Maid Of Heaven, the Spring Champion Stakes winner, and Flight Stakes placegetter Nakeeta Jane have returned to Newnham’s stable to begin their Oaks campaigns and will be joined on that path by VRC Oaks runner-up Greysful Glamour plus a couple of emerging fillies in Proven Class and Scarlet Dream. “I have a bit of depth in the three-year-old fillies staying ranks, it’s a nice problem to have,’’ Newnham said. “Maid Of Heaven and Nakeeta Jane both walked into the stable on Monday. Newnham said if one filly had more improvement than the other come the autumn it could be Nakeeta Jane who hadn’t trialled at the start of August but less than two months later ran third in the Group 1 Flight Stakes (1600m). Maid Of Heaven, of course, gave Newnham and jockey Rachel King their first Group 1 win when defeating the colts in the Spring Champion after running sixth in the Flight. “For (Nakeeta Jane) to get through to a Group 1 and be unlucky beaten a head and a head, it’s pretty good for a first prep,’’ he said. “There wasn’t a lot between them in the Flight Stakes because Maid Of Heaven didn’t have much luck from barrier one and didn’t get much momentum. Newnham said he has no plans to split up those fillies, or Greysful Glamour, but the likes of Proven Class and Scarlet Dream, winners at Newcastle last weekend, would head towards a race like the Adrian Knox and, if good enough, then to the Oaks. At the same time don’t be surprised if one of his proven Group 1 fillies takes on the colts again. 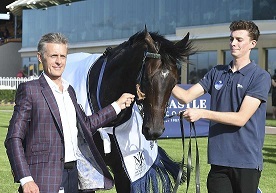 “The fillies at two through the Slipper, Sires and Champagne were too good, Maid Of Heaven beat the colts in the Spring Champion so if one of them looked like they could take them on again in the Rosehill Guineas or the Derby I wouldn’t be afraid to look at those options,’’ he said. Meanwhile, Newnham said Lanciato won’t be asked to stretch to a mile in the autumn as he believes he’s best suited up to 1400m. Mark Newnham (left) with Lanciato. (Pic: Bradley Photos). That opens up a race like the Group 1 All Aged Stakes (1400m) as a Sydney Carnival target though he’s likely to tackle the Newmarket Handicap in Melbourne first. The gelding ran fifth behind Everest placegetter Osborne Bulls down the Flemington straight earlier this month ending a frustrating campaign. “He just drew the wrong side for him and I would have liked to have been where Osborne Bulls was,’’ Newnham said. “The idea was to give him a look at the straight and see if it is worth going back for the Newmarket. “He’s got a good race in him. We’ve just had a prep where not everything went his way. I’ll restrict him now to 1200m-1400m, in his two Group 1 miles he’s shown the mile is a bit beyond him. Visit Racing NSW for fields, form and replays for meetings across the state.